We have currently reviewed 15 Audio Technica headphones. They're a versatile brand with many varied and affordable models. 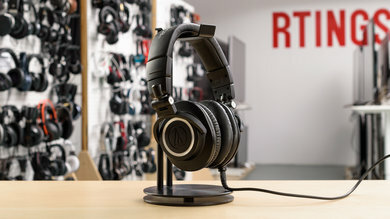 We plan on publishing a lot more Audio Technica headphones reviews throughout the year and we will continue to update you on any new headphones that we test. Diverse Headphone Lineup. Audio-Technica has a vast lineup of headphones geared towards different types of listeners. They make professional, closed and open back model, as well as well-rounded, all-purpose headphones for everyday use. Good, Affordable Headphones. Audio-Technica offers a couple of series, specifically designed to deliver an accurate audio reproduction. These models like the ATH-M50x have an excellent sound quality and are significantly more affordable than the competition. Weak Noise Isolation. Although Audio-Technica has a Noise Cancelling series, their models are comparatively less isolating than other similarly designed headphones in the same price range. Mediocre Build Quality. Audio-Technica has some premium models that feel well built and durable. However, most of their line up are decently performing, affordable headphones that feel a bit cheap at times, especially in their build quality. Overlapping Models. Audio-Technica's lineup can be a bit confusing. They have a lot of very similarly designed headphones with slight incremental upgrades that don't really add much to the headphones. Overall, Audio-Technica offers a broad variety of headphones and models. They're an affordable brand that still delivers in the sound department, the ATH-M series being especially popular for their stellar audio quality and comparatively low price. They might not have the best build quality, and most of Audio Technica noise canceling headphones are a little weak in isolation, but the sheer variety and audio fidelity of some models in their lineup make them a reputable and often recommended brand. Audio-Technica's diverse lineup ensures that you will find a pair of headphones to suit your listening habits and preferences. We have yet to review some of the series in their vast lineup, but below are the typical use cases for the different model names. ATH-ANC = Noise Canceling closed-back headphones meant for traveling or commuting. ATH-M = Affordable closed-back headphones, with great sound quality for studio use. ATH-A = Audiophile-oriented and typically open-back headphones with a neutral sound for critical listening. ATH-SR = Versatile closed-back headphones with a wireless design. Some also have noise canceling. The best Audio Technica headphones for audio quality are the ATH-M50x. They are popular over-ear headphones, thanks to their almost unmatched price to sound quality ratio. If you're looking for a sturdy and durable pair of headphones that you're primarily going to use to listen to music, then they're a great option. They're comfortable and have an excellent sound quality but they do not block a lot of noise. The Audio-Technica ATH-MSR7NC are a more versatile and premium alternative to the M50X. They do not sound as good but still deliver a balanced sound profile that would satisfy most listeners. They're also noise canceling which makes them a bit more suitable for commuting and traveling than the M50x, although their isolation performance is not as strong as some of the other noise-canceling headphones we've tested. On the upside, they're well-built, they don't leak and they're very comfortable. They're also cheaper and more well-rounded than the ATH-M70x. Audio-Technica is a well-known brand. They make affordable headphones that can compete with some higher-end models in the sound department but may not be as well built. Their noise-cancelling series struggles to deliver good isolation in loud environments but when it comes to audio reproduction, some of their headphones are exceedingly well balanced, even at their incredibly low price range.